The Molson regional championship did not continue for 1972 so the Players Canadian FB series expanded to nine races. The Jim Russell-backed team of Jacques Couture and Dave McConnell also departed leaving their closest rival from 1971, Fred Opert's Canadian partner and series regular Brian Robertson, to win the championship in his new Chevron B20. His main challengers were the ever-present Craig Hill in his one-year-old Lotus 69 and Ric Forest in a new March 722. Early the following year Robertson suffered a serious crash in practice for the Singapore GP and developed vertigo that forced his retirement. Ecurie Canada arrived in FB in 1972 having bought out Wilson Southam's engine building operation. With ex-Shelby mechanic Tom Greatorex taking over engine preparation and Andy Roe preparing the cars, they ran two March 71BMs for Ian Coristine and Reg Scullion. Ecurie Canada had been formed in 1969 by Montreal stockbroker Monty Gordon as a syndicate of Ottawa businessmen to support the career of 22-year-old Kris Harrison. The highly entrepreneurial Harrison later assumed the running of the operation. 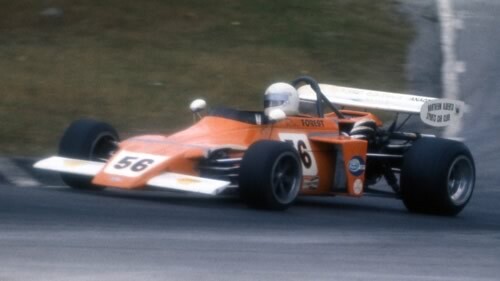 As in 1971, Players races attracted fields of about 20 starters but Formula Fords were no longer needed to fill the grids. Overall competitiveness remained very high with 40% of the cars starting races being 1972 models and another 25% being just one year old. For the constructors, the big change was that Brabhams didn't win a single race and virtually disappeared from podium positions. Chevron won six races, with four for the Fred Opert Racing B20 of champion Robertson and one each for the older B18s of Bill Brack and John Powell. Two fell to the Lotus of Hill and two to the new March 722s which had sold in huge numbers across North America. The 1972 Brabham was the monocoque BT38B and with Ron Tauranac's retirement and importer Fred Opert's increasing focus on Chevron, sales were poor. Only two BT38s appeared regularly in Canada in 1972.